We’ve rolled through the NFC in our preseason division predictions, which means it’s time to analyze the division that’s essentially owned by the New England Patriots, the AFC East. For the past seven seasons — and 12 of the last 13 — the Patriots have finished in first place. The question is, will they repeat once again, even with Tom Brady potentially missing the first four games of the season? After discussing Aaron Rodgers and the NFC North, let’s chat Brady, and more specifically, the rest of this interesting division. These are our preseason AFC East predictions; we’ll start by ranking each team in the AFC East. Tom Terrific will be back by Week 5. Unfortunately for the rest of the league, we believe the Patriots are good enough to go 2-2, or possibly even 3-1 during his absence. With that said, a mad Tom Brady is never a good thing for the rest of the league. He’ll likely come back looking to absolutely shred anyone who gets in his way. The Patriots are the favorites, as always, and even without Brady for four games, it won’t change the outcome of the division in 2016. Expect the Patriots to head things up, not struggle much along the way, and then make yet another Super Bowl push. Sounds like a story you’ve heard before? While it’s hard not to be weary of the Jets with the whole Ryan Fitzpatrick/Geno Smith situation still being worked out, this team is talented enough overall to push for the top spot. They won’t beat the Patriots, and we aren’t even sure if they’ll be able to make the playoffs, but they should still win close to 10 games once again in 2016. The addition of Matt Forte was an excellent one for this team, and even if Smith winds up under center and begins to struggle, he’ll have a consistent safety outlet in Forte, which will be huge for his growth. The Jets have their dynamic duo at wide receiver in Brandon Marshall and Eric Decker, while they’re also piecing together a pretty scary defense, which allowed just 19.6 points-per-game last season. There’s reason to believe in the Jets. The future is pretty bright for this team. 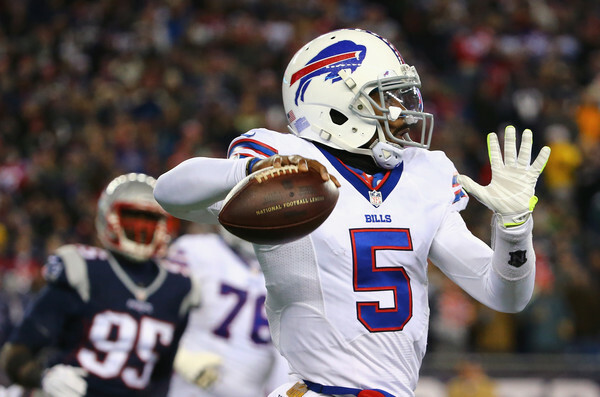 Yes, we predict that the AFC East finishes in the exact same order as it did in 2015. It’s hard to argue for it any differently, largely due to the fact that a team like the Bills — who are good — are still not quite as good as the Jets. On the flip side, they aren’t as bad as the Dolphins, which puts them in the No. 3 spot in the AFC East. While Tyrod Taylor took major strides forward, we don’t believe he’ll be able to get this team over the hump and back into serious playoff contention. The Bills finished 8-8 last season, and a similar record this season seems about right once again. Expect Buffalo to finish at either 7-9 or 8-8, while looking up at both the Jets and Patriots. Rex Ryan will push this team through eventually, but it just won’t happen in 2016. The Dolphins haven’t made the playoffs since 2008, and this year was the only time they made it dating all the way back to 2001. Over the 14-year span, they’ve managed to finish better than third in the division just four times. While we do believe the Dolphins can turn a corner under new head coach Adam Gase, this team has a major uphill battle in front of them. The Bills, Jets, and Patriots are all capable of making a push at the playoffs, and the Dolphins are facing uncertainty at both quarterback and running back. Ryan Tannehill regressed in 2015, and now they badly need him to right the ship. As for the running back position, the team is confident in second-year running back Jay Ajayi — they let Lamar Miller walk in free agency — but let’s not get too far ahead of ourselves. Ajayi has just 49 rushing attempts at the NFL level, and is now expected to be a full-time back. Miami is in for a bit of a rocky season, especially in such a brutal division.